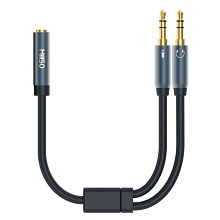 For simultaneous connection of two headphones or speakers to an audio source. 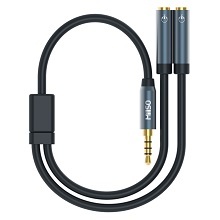 Suitable with smartphones, MP3 players, laptops, PCs, tablets, car with 3.5 mm headphone jack. The elastic and stretchable PVC sleeve is extremely tensile-resistant and effectively withstand external damage. High quality aluminum housing assure longevity. Gold plated socket and plug provide a secure hold and ensure the highest stability even with frequent plugging in and out. Professionalism down to the smallest detail. With a flexible cable clamp, the distance between the two sockets can be freely adjusted. This prevents the pivot-point of the splitter from breaking. 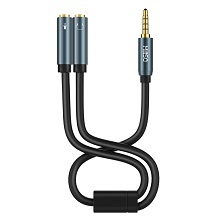 The Aux Y splitter cable is not only stylish, with the adapter you can share with friends favorite songs or movies. Any product from MillSO enjoy a lifetime warranty, welcome to contact us. 1 Male plug: for PS4, Xbox One, Smartphone ... which has a combo headphone mic jack. 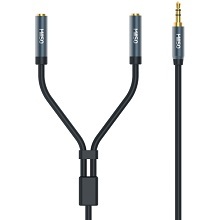 A jack for mic and a jack for audio of one headphone, NOT 2 headphones. 2 Famale jacks: for two 3 pole trrs headphones or speakers. 1 Male plug: for audio source such as smartphones, MP3 players, laptops, PCs, tablets, car with 3.5 mm headphone jack. 1 Male plug: for Laptop, Tablet, PC computer or Smartphone with a 4 pole trrs 3.5mm combo jack. When using the mic function, the plugs of microphone and headphone must both be 4 pole TRRS. 1 Famale jack: for 4 pole trrs 3.5mm combo plug headset. 2 Male plugs: for tablet, notebook or PC with separate microphone and headphone jacks.